WHAT IS LEFT TO SAY YOU HAVE SAID ABOUT EVERY THING EXCEPT ITS TIME TO SAY GOODBYE SMITHY AS HE HAS DONE SO MUCH DAMAGE TO THE BRITISH WAY OF LIFE WE CAN DO WITHOUT PEOPLE OF HIS KIND (A LIAR AND CHEAT) ONLY OUT TO MAKE A LIFE OF LUXURY FOR HIMSELF AND MISERY FOR THE TAX PAYER WHO ARE TRYING TO KEEP THEIR HEAD ABOVE WATER. Excellent blog, but are you surprised this spineless liar, cheat and fraudster hasn’t kept his word? Offer to send a press release which includes this latest evasion plus his Army career, bettsygate, non existent degree and the potential culpable manslaughter investigation? Mike with your literary prowess this should bring him to heel. Especially if you can get it published in sympathetic press. I fear you hold me in too high esteem, Sir! However, I’ll probably give it a go. I wonder whether a family who has had a member die because of this nasty little man could lodge a complaint to the police. The only thing IDS is missing is a black uniform with a peaked cap, similar to those worn by thugs in Germany years ago with the initials SS. You can only try Mike, the man needs a good smack, being a coward, he will run for deep cover behind Cameron’s skirts, unless of course Cameron perceives this as collateral damage which could threaten his current position and the outcome of the election. In which case IDS will be hung out to dry alone and scared. Maybe we could start proceedings as proof of intent. Has anyone seen In Deep Sh*t? Anyone? Tell him Mr Cameron would like a word …..
And then his constituents …. And then the disabled people of the land….. It is claimed by Mr Iain Dumb C*** Smith, that his Universal Credit scheme will save £38 billion. Has there been anything published showing how this figure has been arrived at or is it a figure that he has just plucked from the air? It’s probably another one of his Beliefs. His absence is also notable in every newspaper article not directly written by himself or by some fawning lickspittle trying to back him and/or his policies with the vacuous “it needs to be done/changed/screwed up” lines. When not “a spokesperson” then it seems that for all quotes IDS hides and puts the equally nasty Fester McVile out to speak like some deranged acolyte or profit for the unspoken, but mystically transfered, teachings of IDS while the deranged anti-christ hides from public life like some hermit due to the fact that every reform and change is now slowly collapsing in a heap… UC, not fit and unworkable; UJM total waste of time and money and full of spam; BT starting to fail so spectacularly that the DWP has resorted to asking councils to help them prop it up by giving details of FtT’s that are won so it can try and mount a challenge (hahaha good luck with that [sark]); welfare to work schemes producing worse outcomes than doing nothing at huge expense; 40%+ appeal success rate for “fit for work” when the person is blindingly not fit for work, in some cases literally blind and unfit…. need I go on? The man is a reverse midas, everything he touches turns to sh*t.
Time for Ian Duncan Smith to fall on his sword. All MPs should be demanding his resignation. All bullys are cowards – stand up to them and they back down. 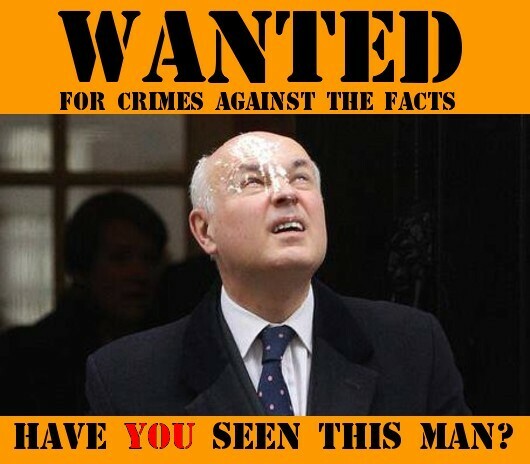 Seems that even DWP staff are bullied by him – why isn’t the civil service doing something about it. Time someone stood up to the plate and declared his reign of terror over. Thank God he never was prime minister. Think he has ideas of grandeur. Time to call him to account before a select committee. He thinks he is above the law and no one can touch him. Time to bring him back down to earth. I urge everyone to contact their MP and call for his resignation. why,what a brilliant blog. keep up the good work mike,and the pressure on that obnoxious piece of sh*t. hound him to the ends of the earth,then turn your firepower on to that other swivel eyed prevaricating b*st*rd j unt. Thank you very much. I’m already extremely interested in Mr *unt, as previous articles about his Bell End incident, his Behind A Tree incident, and the ongoing Unhealthy Service Incident hopefully show. HA HA HA HA IDS’S WORLD IS SLOWLY FALLING APART AND WHEN IT DOES I WILL BE HAVING ONE HELL OF A PARTY IN FACT I WILL SP*NK ALL MY JSA ON A MASSIVE DRINK AND DRUGS BINGE TO CELEBRATE, NO MATTER WHO YOU ARE OR WHAT YOU ARE, YOU CANNOT ESCAPE KARMA, AND BOY WILL IT HAVE A FIELD DAY WHEN IT CATCHES UP WITH THIS VILE B*ST*RD!! Why are the media so oblivious about the death, injustice, lies, and misery that IDS, Freud and the coalition are causing? A convincing case could be made for IDS to be a worthy candidate for DLA or PIP on Mental Health grounds, he clearly suffers from delusions and paranoia, cannot go out alone, is he anxious? . Habitual liar, unable to face the facts, I would think at least MRC/LRM under existing regulations. In my opinion,this nasty little man should be arrested for manslaughter or murder as a serial killer.as he is responsible for implementing policies that seriously affect the lives of our most vulnerable people.This thug and bully sends shivers down my spine of Nazi Germany decades ago. He also pulled out of a Sky News interview yesterday about the bedroom tax and the affects it is causing nationwide. Like all bullies, in my opinion this man is just a coward,is seldom seen on TV or on the streets talking to the public but stays in his dark bunker planning further chaos.